HenFeathers' Lionheart Urn, features a classic arch, and acanthus leaf design along its rim. 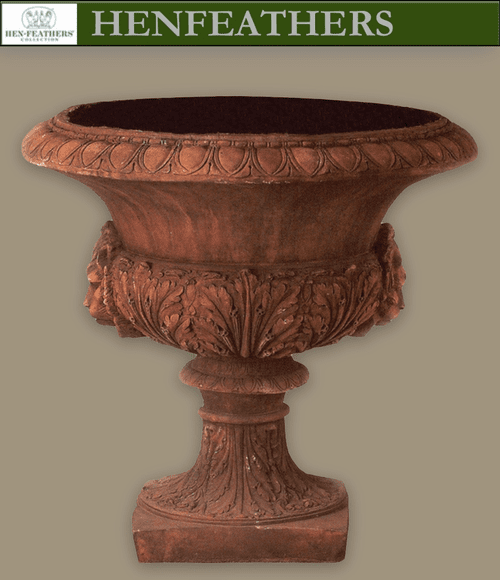 This urn is available in an authentic antique terracotta or Cotswold [clay] patina. Select your finish from the finishes list above. This design is carefully hand molded and hand finished by craftsman to the highest standards of detail in a composition of terracotta, bonded marble and fiberglass to guarantee weather and frost proof durability. Each design is carefully packed and transported to any destination.